The increasing use of the portable diesel generators which can offer a hand accessories in home applications, in which it will produce energy for lighting, sump pumps, particular required applications like refrigerators & air conditioners, and medical equipment is anticipated to create ample opportunities in near future. According to IndustryARC findings, 350-700kVA will hold the largest market share during the forecast period. 350-700 kVA diesel generators are highly reliable and a product which is durable in nature. In these generators, entire elements are manufactured with to operate together to improve the efficiency at part loads, by providing the benefit of lowest operating costs. The pricing trends for diesel generators market varies by the power of the diesel generators installed along with the features that come with it. The ASPs of 0-100 KVA diesel generators are significantly lower compared to other powers of diesel generators and is expected to decrease by more than 3.56% during the forecast period of 2018-2024. 100-350 KVA diesel generators are estimated to see the highest decrease in ASPs compared to other segments and is expected to decrease by more than 4.34% during the forecast period of 2018-2024. The rapid industrialization that is occurring across the world is considered as one of the major factor for the growth of diesel generators market. Various industrial activities such as mining, oil and gas exploration and railways require heavy duty generators for operation. The increasing applications in different industry verticals is expected to drive the market. The base year of the study is 2017, with forecast done up to 2023. The study presents a thorough analysis of the competitive landscape, taking into account the market shares of the leading companies. It also provides information on unit shipments. These provide the key market participants with the necessary business intelligence and help them understand the future of the plastics in electric vehicle market. The assessment includes the forecast, an overview of the competitive structure, the market shares of the competitors, as well as the market trends, market demands, market drivers, market challenges, and product analysis. The market drivers and restraints have been assessed to fathom their impact over the forecast period. This report further identifies the key opportunities for growth while also detailing the key challenges and possible threats. The key areas of focus include the types of Diesel Generator market, and their specific applications in different types of vehicles. Caterpillar Inc and Cummins Inc are amongst the key players in the diesel generators market. While Caterpillar Inc occupies 16.40% of the global market, Cummins Inc has a market share of 13.20% in the diesel generators market. Caterpillar Inc has signed an agreement to acquire Johan Walter Berg AB. This acquisition will help Caterpillar transition from selling only engines and generators to providing complete marine propulsion package systems. Some of the other key players mentioned in this report are Aggreko PLC., Aksa Power Generation, APR Energy PLC, Atlas Copco AB, Briggs & Stratton Corporation, Broadcrown Ltd., Burtonwood Generator & Switchgear Services Ltd. among others. The rapid industrialization that is occurring across the world is considered as one of the major factor for the growth of diesel generators market. Various industrial activities such as mining, oil and gas exploration and railways require heavy duty generators for operation. 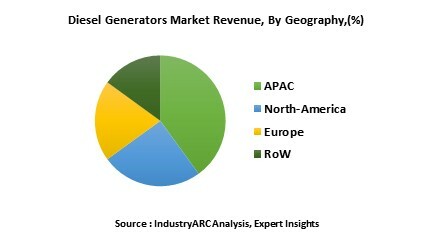 The usage of diesel generators in order to support the energy demand for small and medium sized offices and restaurants particularly in Asia pacific region along with various other factors such as high power density of the diesel generators and the low cost of installation compared to natural gas generators is driving the growth of diesel generators market. The developing countries generally lack the continuous supply of the power which will eventually increase the usage of the diesel generators and will also help in increasing the production of the diesel generators. By increasing the usage and production of the diesel generators will drive the growth of the diesel generator market. Many diesel generator manufacturing companies are focusing on the development of the product by using the advanced technology which incorporated the use of the resilient engine parts such as hardened valves which will help in increasing the efficiency and performance. By using this technology which is used to increase the efficiency and performance of diesel generators will produce better output and will drive the growth of the market. 15.8. Burtonwood Generator & Switchgear Services Ltd.